This is the original mobile phone battery. Truly! Look at the size of your mobile phone fitting as it does in the palm of your hand, and lets look at its origins, and imagine trying to explain the concept of wifi to the Victorians. It all began 150 years ago with the telegraph .. the dot dash dot telex machine. 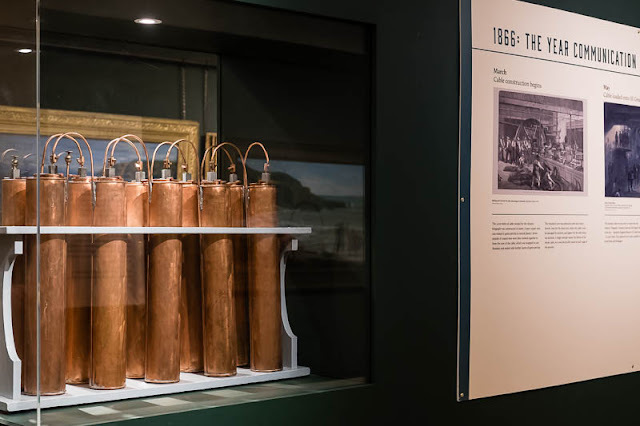 Those copper tubes are the battery that powered the very first trans-atlantic cable for all those dots and dashes that were sent between the two continents. It took four attempts and many years to finally lay a working cable. The first one lasted a mere three weeks. There was only one ship big enough to be able to support the weight of the cable that was rolled out on the ocean floor. The current exhibition at the Guildhall art gallery is a collaboration between artists, curators, scientists, and academics that explores communication. Stop screwing up your nose at your perception of boring and dusty going up your nostrils, and let me tell you how exciting it really is. The cream of all the above disciplines got together (that in itself is a wonder) to create an exhibition that explores Distance, Resistance, Transmission, and Coding. 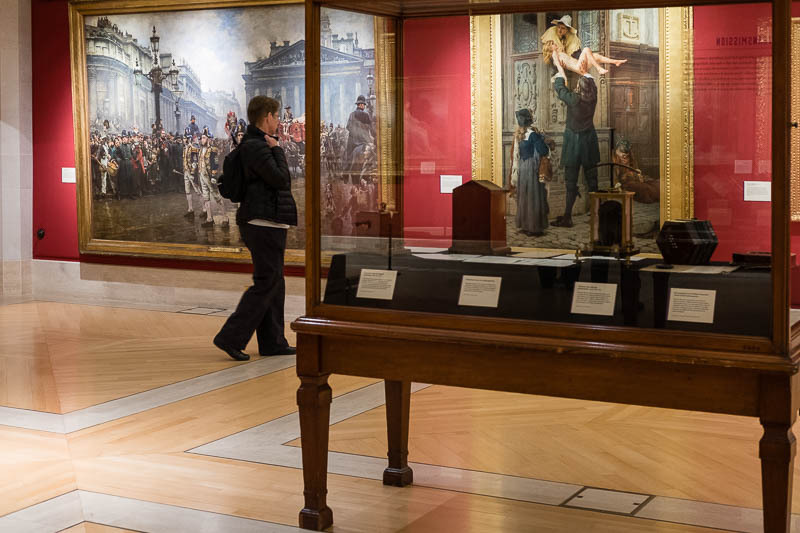 The exhibition includes some extraordinary never-seen-before paintings by Victorian artists as well as rare telegraphic artefacts. I loved the code books that were used by corporations to keep the content of their telegraphs secret. The very first version of a firewall and virus checker! Ok so there's a teeny weeny bit of the geek in me. Students from Kings College have created a wonderful messaging machine - "the great grammatizor" on which you can create your very own coded message. The inspiration for the Kings College students was a story by Roald Dahl. I'm keeping my message a secret for now, but after a few glasses of wine I might reveal its contents. There are several multilayered options for encryption including Shakespeare. Clearly I went for the full Monty and chose "absurd" as one of my options. The selection of paintings is truly inspired and some have not been on public display in our lifetime (no matter what age you are). To really get the best out of this exhibition I totally and utterly recommend that you go on one of the curator talk days. I'll list the dates below, and giant plus ... they are free! For me the curator talks turned the exhibition into pure magic. 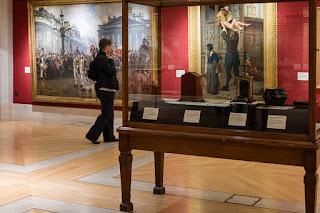 Sounds like a wonderful and interesting exhibition. I would enjoy this exhibit! Looks like I should come back! This sounds very interesting. My hotel sent me an email this morning urging me to come back for some holiday shopping.